In the Crimean War, British light cavalry led a fatal assault on the Russians and Turks. The result was fairly predictable as they charged against an artillery battery and a well-organised fire line. Overlooking what became known as The Valley of Death, the British and French Generals sipped tea and champagne from their ringside seats, watching the mayhem unfold. 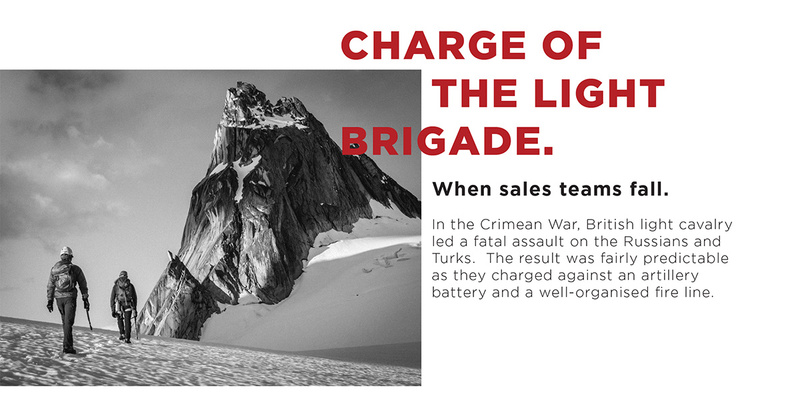 What led to this courageous tragedy had more to do with miscommunication than anything else but let’s talk about how we really support our sales teams – the brave and willing light cavalry. Too often, we release our sales team into the field with nothing but their sales target to sustain them. Sales budgets do not create sales – support actions create sales. If they’re fighting against artillery, you’d better make sure that you support them with their own artillery otherwise the results will also be quite predictable. Assuming that your product is competitive, what support might your sales team need? A responsive, UX-friendly website which converts interested visitors into near-clients. A place where, within seconds, the prospect knows exactly why they should connect with your sales team. It should also be well optimised so that those looking for what you offer find their way through enemy lines to your side. Unleash your reconnaissance troops, working behind enemy lines and influencing. Here, I refer mostly to LinkedIn in a B2B environment, quietly but effectively preparing ground for a landing or assault. Let your sales team boldly fly their flag high, accompanied by a war cry which intimidates and even terrifies the opposition. Your brand. Your belief system. Your promise. What do people think when your rep enters the room? Imagine you’re representing Joes Sportswear and the rep from Nike enters the room. Make your reps feel like Nike reps. When you’ve fought a long battle to break through and you’ve now got a chance to present, make sure that you win that pitch. Plan every slide as if it were a battle for the minds of your near-client, each word must win you ground. No waffle, no side shows. Sales teams are like infantry or cavalry. They need artillery, air support and today, drones to support them. As leaders or Generals, we need to ask ourselves whether we’re watching the brave but ill-fated charge from safety of the surrounding hill or making sure that our field forces have every chance of success with minimal casualties.